The need to handle increasingly larger data volumes is one factor driving the adoption of a new class of nonrelational NoSQL databases. Advocates of NoSQL databases claim they can be used to build systems that are more performant, scale better, and are easier to program. 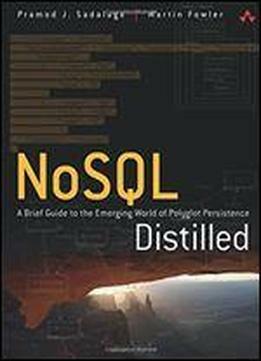 NoSQL Distilled is a concise but thorough introduction to this rapidly emerging technology. Pramod J. Sadalage and Martin Fowler explain how NoSQL databases work and the ways that they may be a superior alternative to a traditional RDBMS. The authors provide a fast-paced guide to the concepts you need to know in order to evaluate whether NoSQL databases are right for your needs and, if so, which technologies you should explore further. The first part of the book concentrates on core concepts, including schemaless data models, aggregates, new distribution models, the CAP theorem, and map-reduce. In the second part, the authors explore architectural and design issues associated with implementing NoSQL. They also present realistic use cases that demonstrate NoSQL databases at work and feature representative examples using Riak, MongoDB, Cassandra, and Neo4j. In addition, by drawing on Pramod Sadalage's pioneering work, NoSQL Distilled shows how to implement evolutionary design with schema migration: an essential technique for applying NoSQL databases. The book concludes by describing how NoSQL is ushering in a new age of Polyglot Persistence, where multiple data-storage worlds coexist, and architects can choose the technology best optimized for each type of data access.